A 13 year old female-spayed indoor-only DSH cat was presented to SNHVRH's Neurology service with a one-month history of lethargy, poor appetite, and circling. The cat had a depressed mentation, was circling to the right and pacing, and had a positional nystagmus fast-phase rotary left. A neurolocalization of right supratentorial + right infratentorial was made. 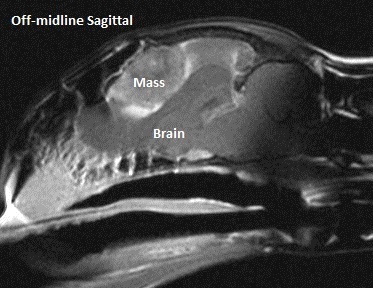 MRI revealed a large extra-axial mass within the left rostrodorsal aspect of the cranial vault with calvarial destruction and some extension into the caudal aspect of the frontal sinus, with marked perilesional edema, and severe transtentorial and transforaminal herniations. While the mass was primarily left-sided, its large size resulted in disruption of both left and right cerebral hemispheres, accounting for the right supratentorial signs. The transtentorial and transforaminal herniations accounted for the cats infratentorial/ brainstem signs. Meningioma was the top differential for this mass, with lymphoma and sarcoma deemed less likely. The patient was given mannitol and Solu-medrol during the process of performing the MRI. A CSF tap was not performed due to the risk of performing such a procedure in a patient with increased intracranial pressure and transforaminal herniation. The patient recovered uneventfully from anesthesia and was discharged on prednisolone (1mg/kg/day). Surgery was recommended for a future date, after sufficient time to allow prednisone therapy to reduce perilesional edema. The patient returned 11 days later for surgery. A bilateral rostrotentorial +bilateral transfrontal approach was used to remove the mass, which measured approximately 2.5cm in diameter. The patient was discharged two days later, at which time she was knuckling on her right thoracic limb but ambulatory, eating well, and interactive with caretakers. She was tapered off prednisolone over the following 2 weeks. Histopathology of the mass was consistent with a meningioma. Prognosis for the patient is good. Feline meningiomas are one of the most treatable intracranial neoplasms in small animals. With surgery as the sole therapy for an intracranial meningioma, cats live on average 1.5-4 years. Approximately 25% of cats will have a recurrence of signs associated with tumor regrowth after surgery – in these cases, a second surgery is recommended and is associated with a success rate and long survival time similar to that seen with the initial surgery. Many owners are under the improper assumption that a “brain tumor” is a death sentence for their older cat, but quite the opposite is true. If you are treating an older cat with intracranial signs, feel free to contact our neurologist, Dr. Heather Jones, or have the owner set up a consultation to discuss their pet’s signs to determine if an MRI is warranted to evaluate for a meningioma. Many owners are under the improper assumption that a “brain tumor” is a death sentence for their older cat, but quite the opposite is true. 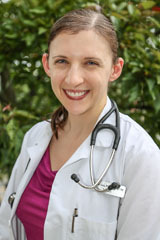 If you are treating an older cat with intracranial signs, feel free to contact our neurologist, Dr. Heather Jones.